If you’re planning to pursue a career in digital marketing, you will need a strong CV that attracts recruiters and impresses employers. There are plenty of digital marketing opportunities out there, but your CV must stand out amongst the crowd of competing candidates if you want to land interviews. 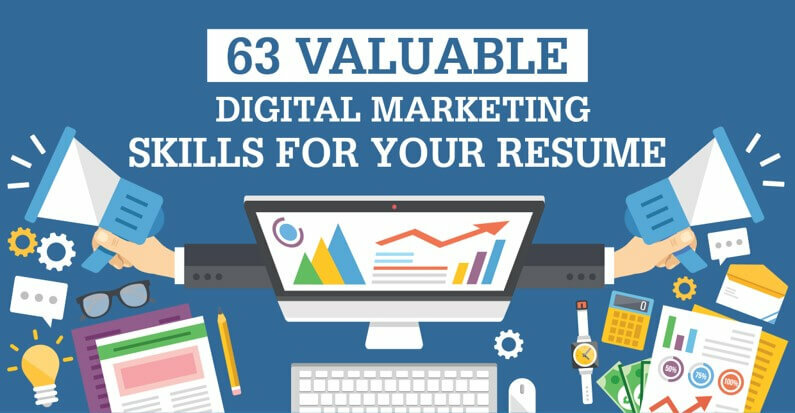 StandOut CV have provided this digital marketing CV guide infographic to show you 63 of the most valuable skills to highlight in your CV, broken down into the following categories. Online businesses rely on organic traffic to provide them with a constant stream of potential new customers. If your CV can prove your ability to increase your employers’ search rankings, you will boost your value as a candidate. Pay per click advertising knowledge is an important skill for any marketer. The ability to strategise, manage and optimise PPC campaigns will make a great addition to your CV. Designing and launching an effective email campaign requires plenty of skill and tool knowledge. With email providing the best ROI of all digital marketing channels, it’s important to highlight any relevant experience you may have. With social media playing such a vital role in modern marketing, social media management skills are in extremely high demand. If you have any experience of growing and managing company social presences, then it is certainly worth mentioning in your CV. Good user-experience on company websites ensures that leads are captured and sales are made. Experience in customer focused web design is a healthy component for your digital marketing CV. Andrew Fennell is an experienced recruiter, founder of CV writing service StandOut CV and author of How to Write a CV - The Ultimate Guide.